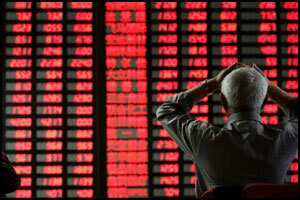 Hong Kong: Asian markets fell for a third straight session and the euro sat at 11-month lows on Thursday on growing doubts over last week’s European debt deal as Germany warned the crisis would last for years. Tokyo was 1.32% lower by the break, Hong Kong fell 2.36%, Sydney was 1.75% lower, Seoul shed 1.79% and Shanghai lost 1.55%. German chancellor Angela Merkel added to the already weak sentiment when she told the Bundestag: “Getting over the state debt crisis is... a process. This process won’t last weeks, it won’t last months, it will last years." Although she said the region would overcome its problems investors remained risk-averse, sending yields on under-pressure Italy’s five-year bonds to a euro-era record high while its 10-year bonds moved back towards the seven percent level considered unsustainable. “The jitters are turning stronger again," said Mirae Asset Securities analyst Lee Jin-woo in Seoul. “Judging from the rising yield for Italy’s government bonds, the markets haven’t found confidence even after the European summit," Lee told Dow Jones Newswires. European Union leaders from 26 of the 27 member states agreed at a high-stakes Brussels summit last week to back a Franco-German drive for tighter budget policing in a bid to save the eurozone. After Britain, which does not use the euro, blocked changes to an EU-wide treaty, the other 26 EU states signalled their willingness to join a “new fiscal compact" imposing tougher budget rules. However, the summit’s plans for a $200 billion boost to the International Monetary Fund were thrown into doubt when Germany said it would not provide any extra cash if other non-euro member nations, including Britain and the US, did not contribute. Meanwhile Standard & Poor’s is expected to decide soon whether or not to downgrade 15 of the 17 eurozone members after putting them on warning last week. And rival agency Moody’s has said the crisis talks failed to produce “decisive policy measures", saying it would review the credit ratings of all EU states within the next three months. The euro remained below $1.30 after slipping below the psychological figure in New York. The common currency fetched $1.2991 in early Asia trade, compared with $1.2981 late Wednesday in New York. The unit is at its lowest levels since January. It also bought ¥101.41 from ¥101.26. The dollar bought ¥78.06, nearly flat from ¥78.08 in New York. In Japan the quarterly Tankan survey of manufacturers showed a majority were downbeat about the outlook due to Europe’s travails, the stuttering US recovery, Thailand’s flood crisis and the strong yen. Large manufacturers’ sentiment in December dropped to a worse-than-expected “minus four" from September’s positive “two", the Bank of Japan’s survey showed. The figures represent the percentage of companies saying business conditions are good minus those saying conditions are bad. The latest reading was worse than the median forecast of “minus two" by economists polled by Dow Jones Newswires, and marked the first drop since June, when the headline reading stood at “minus nine". Oil prices remained subdued after falling heavily overnight due to concerns over demand in Europe and in the wake of oil cartel Opec’s decision to maintain its current production levels. New York’s main contract, light sweet crude for January delivery was four cents lower at $94.91 a barrel and Brent North Sea crude for January delivery 13 cents down at $104.89.